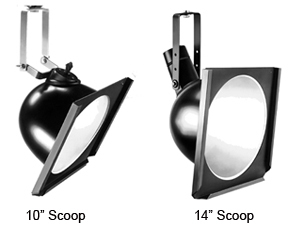 The Spectra Cyc is a 100 Watt cyclorama wall wash luminaire utilizing red, green, blue and amber LED emitters. Designed for theatrical and architectural applications, the Spectra Cyc blends colors via a patented LED lens which reduces pixelization from direct view. The on board power supply allows for direct power & data input which can be daisy chained thru 20 units.. Designed for use on 8’ centers maximum, individual units can be linked side by side for greater saturation of light. The Spectra Cyc is compatible with both DMX and RDM protocols, and comes complete with a library of pre-programmed single colors to various color mixes. Units are made for floor or Sky-Cyc applications. The Altman Econo-Cyc is a single cell fixture which can be linked together to make a multi cell unit. They can be used as floor or hanging fixtures. 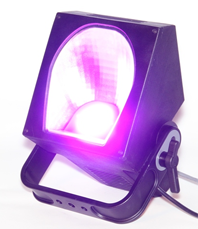 Comes with color frame and safety cable (order lamp, hardware, and connectors separately). A lightweight, wide spread, luminaire designed to provide and even wash of light on cycloramas; the four light sky cyc, when mounted 8 feet from the cyc, 12 feet on center will typically provide better than 1.3 to 1 uniformity between luminaires with a minimum of 176 footcandles at the bottom of a 20' cyc. Available in many configurations, the SKY-CYC is ideally suited for use in theatres and television studios as a compact, lightweight means of lighting large cycloramas from above.